I had an idea for an adult story a couple of days ago, this after weeks…months…a couple of years of very little motivation to write anything. Knowing that I write fast and dirty, and needing to break this logjam, I decided to write 1,000 words a day of the new work for 60 days. Without fail. And see what comes out of it. Dec 27: Day One of Holiday Let – 1113 words – this included about 800 words of a scene, and a couple of hundred notes about what was going on in my head as I worked on it. Dec 29: 1079 words of another scene. Dec 30: Three (today) – 1206 words of a third scene. I have my three main characters on scene, with reference to two others who may be significant. A few plot points have spontaneously developed as I’ve been punching words onto the page. And I’m immersed in the setting of the North Cornwall beach town of Perranporth, complete with the ‘lost church’ of St Pirrans – in both the present and late-60s when my family rented a holiday house (a ‘Holiday let’ as they are known in England) each summer for a number of years. My voice is rusty. My typing not so hot. But I am determined to keep plugging on, writing full scenes, worrying about the narrative connective tissue later, doing nothing more than giving each day’s work a quick read through and adding a few thoughts for next day’s session as it occurs to me. I’ll check in here from time to time to post an update on how I’m doing. And if you have any thoughts that will help me keep going, do share them here. 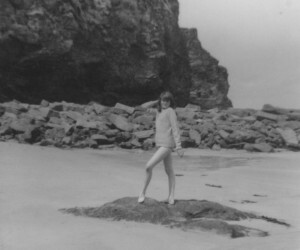 LP posing on Perranporth Beach, about 1966… Photo courtesy my boarding school friend Barbara (Babs) Tipson.